Flour tortillas are stuffed with scrambled eggs, cheddar cheese, diced green chilies and Jones Canadian Bacon. Top with sour cream and salsa. 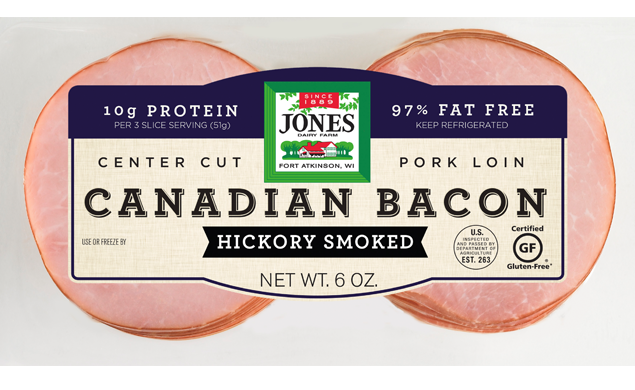 This recipe is made with Jones Canadian Bacon. Beat eggs in large bowl; cook in skillet until scrambled. Mix in can of diced green chilies and set aside. In large bowl mix together enchilada sauce and half and half until well combined. Lightly coat bottom of large casserole dish with small amount of sauce. 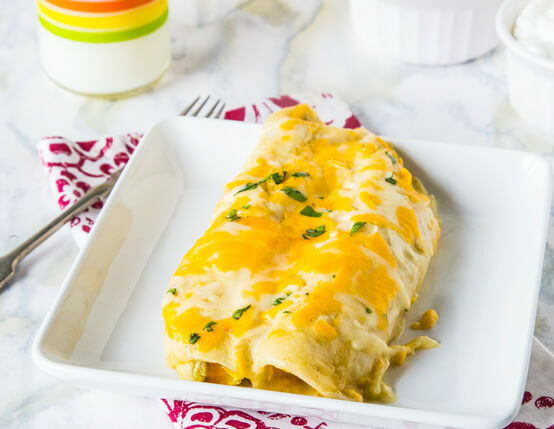 To assemble enchiladas fill each tortilla with eggs, a small handful of cheddar cheese, and about 2 tablespoons of Canadian Bacon. Roll and place seam side down in casserole dish. Repeat with remaining ingredients. Pour green chili sauce over tortillas. Sprinkle with monterey Jack cheese. Cover with foil and bake for 20-25 minutes until sauce is bubbling and enchiladas are heated through. Let set for 5 minutes before serving. Serve with sour cream and salsa if desired. To Make Ahead: Cover with foil and place in fridge or freezer. If frozen, let thaw in fridge before baking. Increase baking time by 5-10 minutes if starting with cold enchiladas. This was really easy to pull together and was delightfully cheesy! Perfect for brinner and the leftovers made quick, easy breakfasts for the next few days. I used fajita sized tortillas so I only used 8 instead of 12, and then I cooked it a bit longer (30-35 min) - still turned out excellent. Would be really easy to adjust spice level with toppings or by adjusting the green chilies you use.